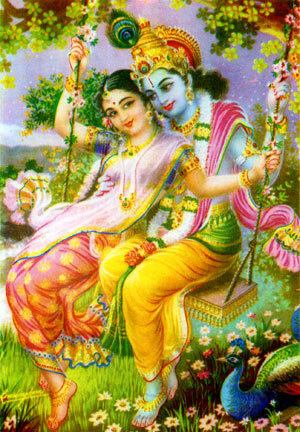 Traditionally Teej is a festival to honour the Goddess Parvati and her marriage to Lord Shiva. After marriage, Shiva realised that Parvati missed her family and so he decided to create an opportunity for the goddess to visit her home and family every year in Badhau (Sept/Oct). Hindus have since continued this tradition. The women travel home to their families and spend time there resting and sharing their married lives with family. 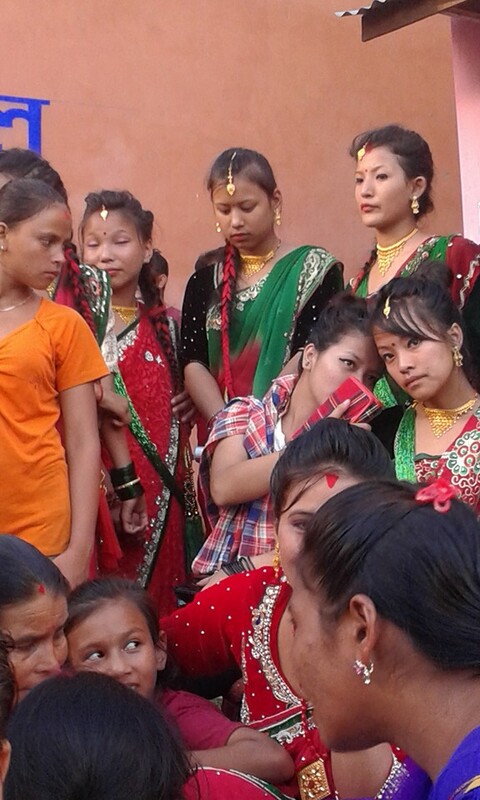 They sing songs and share the hardships of living away from their families and enjoy the dancing and festivities. 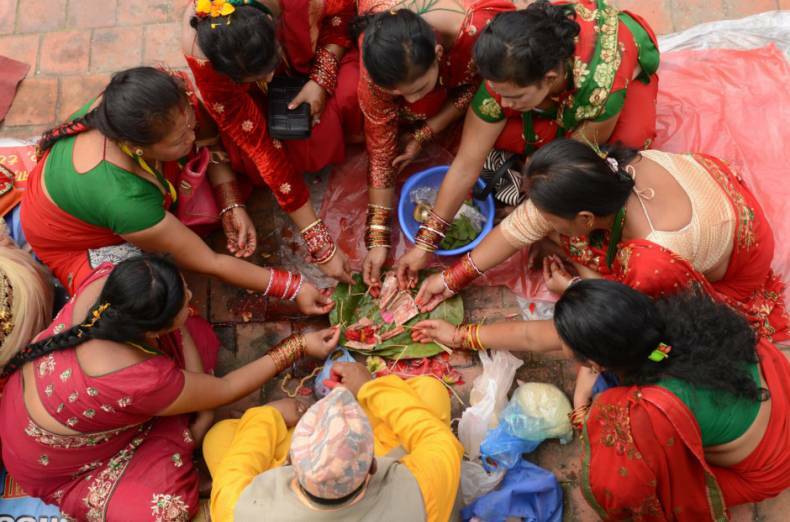 IN Nepal when women marry it is their duty to move to the husbands village and ultimately become the new head of house. The womens role is to look after all the duties around and in the home and take care of the children and aging parents. So often in the beginning it is a hard transition for them resulting in many tears and conflicts between the mother and daughter in law. So every year the Teej festival is welcomed by women as an opportunity to sit together with their families and share their lives. 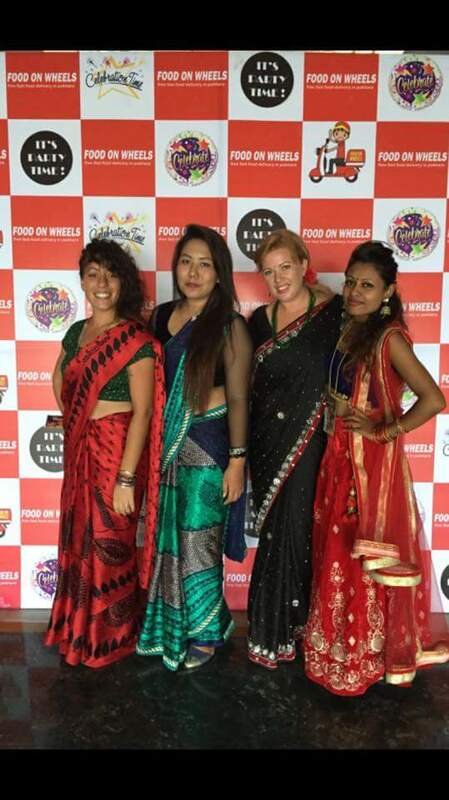 (the men usually preparing the food and celebrations) and dressing up in their finest Sari’s, usually red and green as these are the colours that represent the marriage and union with Shiva. The fasting is seen as not only as a respectful action towards the Lord Shiva but also a cleansing act that is good for health also. A big part of Hindu culture is based on purity/impurity, so it is relative to this that they fast to cleanse themselves in honour of the Lord Shiva and their husbannds. their inner goddesses. A mixture of young and old, no men allowed in these sacred parties as they are a woman only affair… Its interesting, that they go to so much trouble to look so beautiful and amazing for each other and not men on this day. Dancing to a mixture of traditional songs and pop songs, sharing food together chatting and celebrating the goddess. At this time they also walk together to the nearest Lord Shiva temple taking offerings of rice, coconut, fruit and flowers and offer prayer for their husbands or significant men in their life, for long life and good health. It is lovely to watch them in all their beautiful colours walking to the temple, a smiling and chatting rainbow of colour. Spending time in Baglung at this time is so colourful and full of new experiences. Govin and I visited his family at this time because obviously mine is too far away in Australia. When we arrived he was immediately busy, as he is involved with a community group in his village that is active in creating events. It was nice to watch him busy and involved in his community in this way. So respected by his peers. 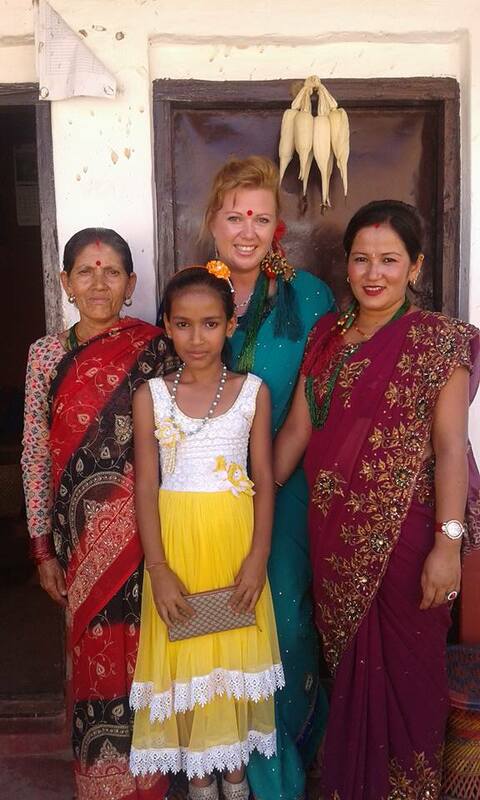 I enjoyed meeting many of the locals and slowly practiced my Nepali. 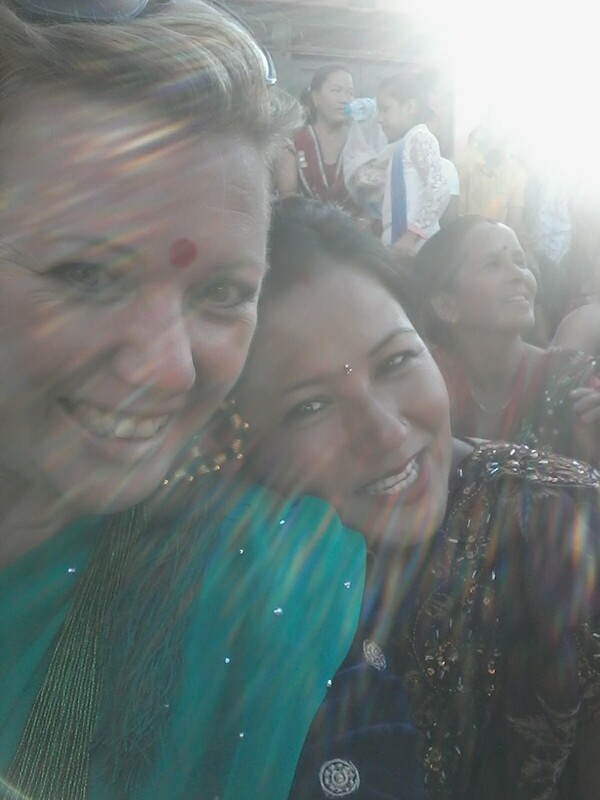 ON the 2nd day I was invited on the stage of the Teej Event as a special guest, so nerve racking and such a strange experience, you see in Nepal they honour guests in a big way, they really revere them. I was so uncomfortable dressed in my sari and on this rickety stage with about 30 other special guests and significant people in the community. After my initial uncomfortableness about being raised above the people, I decided to accept and embrace the Nepali way of doing these things and soon became mesmerised by the process and the work the community group had put in to create this event for their community. Their were performances from dancers, singers and comedians and despite the lengthy talks by wanna be politicians and significant community members and the heat it was enjoyable. Towards the end we were invited to dance on the stage and all of us danced so much that sweat was dripping everywhere, however it was so much fun. 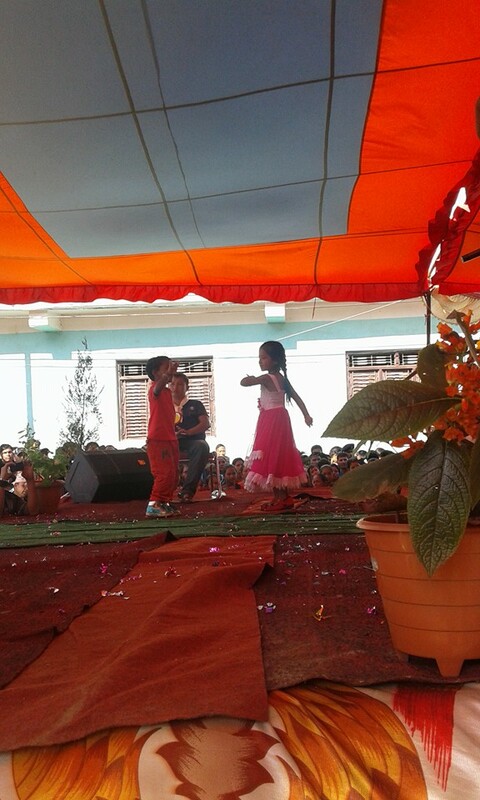 The one thing I noticed, was that boys don’t really dance with girls here. Such a new experience for me, growing up in Australia predominantly dancing as a young person at the local football functions or pubs. The Nepali danced in circles around each other and often their were actions that matched the songs, although I certainly could not figure out what they were about… almost probably all about Love, that much was obvious. Again the rainbows of beautiful colours and all the people in the crowd too, were swirling, twirling, dancing and singing along. During the day the community group ran some events such as shotput, slow race motorbike and the locals all got involved. Govin was so busy during these few days organising and helping his community with this event, that I really was in awe of him and his mates for the brilliant effort they went to to provide their community with this entertainment. Often the view from developed countries is that, women are oppressed in this country, I would argue that in some cases that maybe true, however I also have witnessed and experienced a very different reality to that one lopsided view. Women in here are strong, have opinions, and desires and needs and go about getting them. The role they play in their communities is a significant one, often the glue of the family and providing their husbands a place to rest after working and providing for the family. Women in here respect and take pride in their roles, they want to be good at being a wife and mother. Some may also have other dreams and no doubt as education increases, then so will their desires and dreams expand, however lets not remove the womanness in our desire for equality and or development. Lets not undervalue the role of women in the family, and the important part they play in raising our children and keeping families together and functioning. Its a fine line we walk in liberating supposedly oppressed women and supporting and lifting up something that already exists to be respected and revered in a whole new way…. Maybe the tribal communities have that right… We need women to band together to support each other, as they say it takes a village to raise a child, lets not undervalue the amazing job women are doing all over the world. We don’t need to modernise them to stop oppression, we need to educate people in the value of the roles they play.